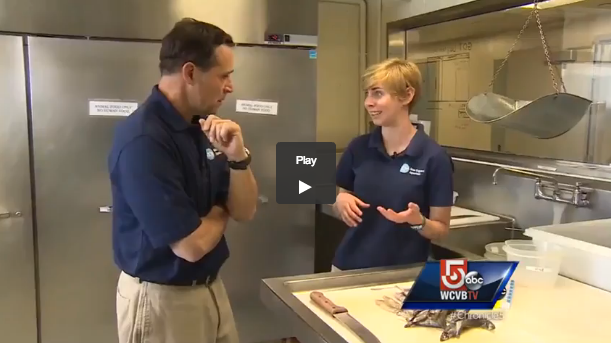 Ted Reinstein with WCVB's magazine show Chronicle recently donned an Aquarium uniform and spent the day as a summer intern with us. We put him to work preparing food for the animals in the Giant Ocean Tank—including fish tacos for the loggerhead sea turtles (you'll see what we mean when you watch the clip)—giving talks at the top of the tank and helping visitors at the Edge of the Sea tidepool touch tank. Click here to watch the clip on WCVB.com to see whether this TV reporter can hack it! Behind the scenes in the Giant Ocean Tank "kitchen"
Our competitive internship program welcomes nearly 70 people each summer, from all walks of life. New England Aquarium interns gain hands-on experience and explore career options while networking with Aquarium professionals and their peers. Want to see the interns at work? Come visit the Aquarium today! They're brimming with information to help answer all your questions. Buy a timed ticket online and print it out at home, you could be watching the loggerheads eat their fish tacos in no time.